Red Wings with only one shot by a forward (Nyquist) in opening 20:00. Patrice Bergeron got an assist on the Dougie Hamilton goal. Bruins are hard to play. Even harder when you torpedo your own game. Very uncharacteristic period by Wings. In reg season, Bs were 43-3 when leading by 2 at any point. 226-10 (15 OT & Shootout losses) in Julien era. Up 3 in RS: 39-0. Times like these, #Bruins ' heavy game only gets heavier for opposition. #RedWings fans booed Lucic throughout the period, but they saved the biggest ones for their own team. They deserved it after an ugly 20 min. #fridgealert : Period 2 to begin approx 0:35 after the hour. Wings to room, file out like they victims of ''Acme Mining and Blasting''. The Red Wings just heard a few boos as they headed into the room for the break. It's 2-0, heading into the break. Feels a little like the opposite of that pre-Thanksgiving game. First period comes to a close with Bruins up 2-0. Bruins lead in shots on goal, 11-4. Bruins up 2-0. Feels like 6-0. Wings miss Ericsson more than Zetterberg. Would have gotten Lashoff or Kindl out of uniform. Per @NHLBruins , that's the fourth Bruin with his first career playoff goal so far. Florek, Smith, Hamilton, Caron. #RedWings trademarks, speed and intelligence, have gone way of horse 'n' buggy. First goal for Jordan Caron since October 5. That one was also against #RedWings. Bruins in charge. Red Wings look deflated. Fans are getting irritated. Brutal line change costs Red Wings. They look lost. JV line change by Wings. Zero attention to detail. Fourth line was doing nothing. For some reason, this game feels like it should be 3-0 or 4-0. Jordan Caron cleans up a shot from Shawn Thornton on a bad line change by the Wings. Jordan Caron on the rebound. Bruins go up 2-0. Rask gobbles up the shot from Kronwall, just the second #RedWings shot recorded in the game with 4:48 left in the first period. Shots are 8 to 2, Bruins. This looks a lot like Game 2. And nothing like Game 1. Bruins have way more energy than the Wings. If not for Kronwall, this game could well be 2 or 3-0. Every time I'm at the Joe, I think about M-A Fleury hitting the deck coming out of the tunnel. Good times. If Bruins control faceoff, Hamilton will switch on for Miller. There's a really angry-looking octopus on the JumboTron right now. He might haunt my dreams. Bruins starting Chara-Miller with Bergeron line. DET counters with Datsyuk line and Kronwall pair. That matchup will stick all series. Corey Potter, Daniel Paille, Andrej Meszaros, and Chris Kelly scratched tonight. It's official, Matt Bartkowski playing tonight for the Bruins. That means Matt Bartkowski will play tonight. Official scratches: Corey Potter, Daniel Paille, Chris Kelly, Andrej Meszaros. 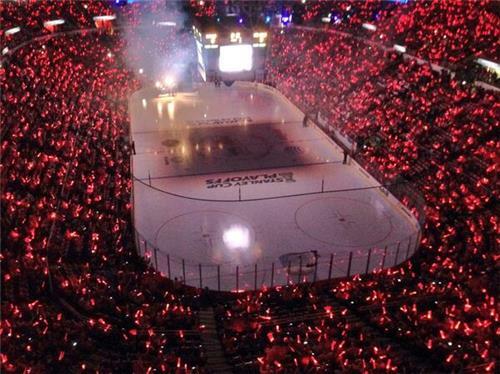 All these red glow sticks certainly make it SEEM like the crowd is pulsating. It's like the visual equivalent of pumping in crowd noise.